Looking for a cheap entré into this winter’s cyclocross? Or just want a bike that’ll take you down a gravel road and back? Reid might have the answer for you in their single speed cyclocross bike, the Reid SSCX. How do you feel about Reid? I’ve ridden half a dozen of their bikes. What they deliver at the price is hard to knock. Doesn’t mean people don’t knock them. It’s easy to compare a $350 fixie with a hand-build custom and find it comes up short. The bikes I’ve ridden, considering their price, have never come up short. That said, Reid are definitely stepping up and those who have dismissed this brand before might have to have a fresh look at the Reid SSCX. 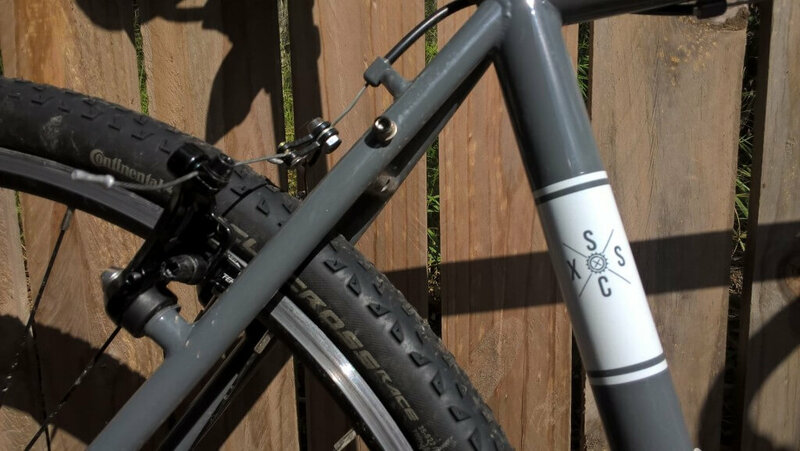 The SSCX is a beautifully finished product. The welds are tiny uniform beads. 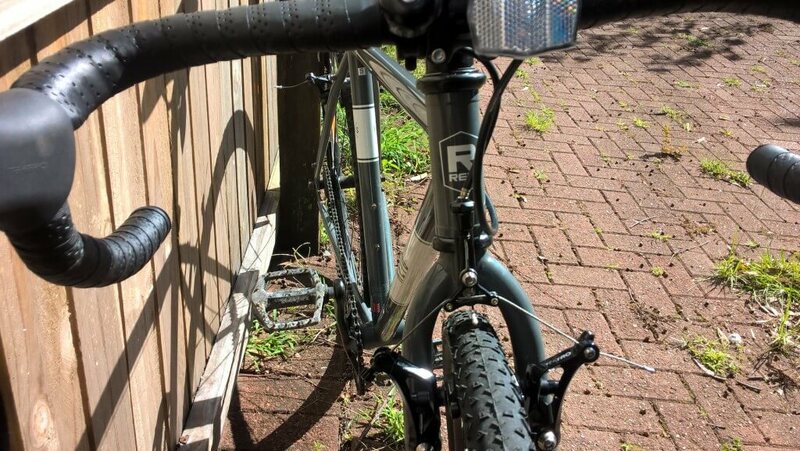 The grey matt looked a treat and the understated Reid and SSCX graphics set it all off nicely. Made you want to climb right onboard and get going. What’s The Reid SSCX About? The Reid SSCX is a tilt at providing us a single-speed cyclocross bike. At $500 retail it’d be a cheap way into Cyclocross, if you’re interested in that sort of thing. (Too much like actual racing for this guy.) It’s also a gravel grinder or tough city commuter, if you want to take it that way. 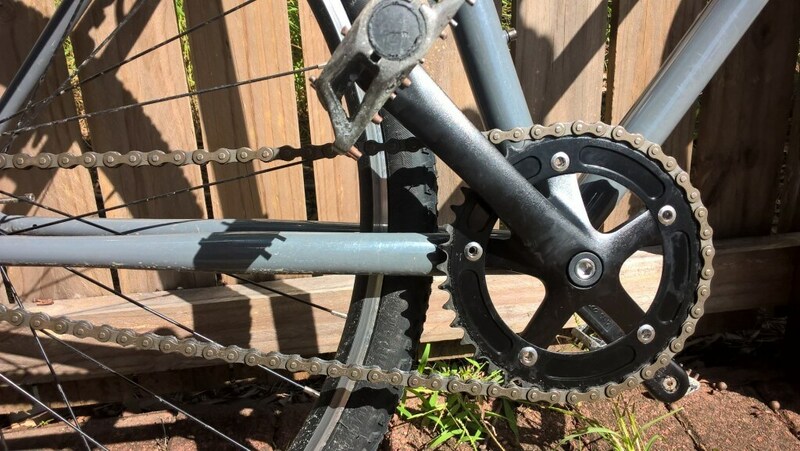 The gearing doesn’t give too much of a hint toward where Reid place the SSCX. I was comfortable riding this bike on road. With the knobby tyres it rolled along quite nicely. Off-road the gearing suited gravel roads and this is where I enjoyed the bike the most. The gearing let me conquer a few small climbs when the gravel turned back to tarmac. And I could imagine it’d just about suit racing cyclocross. Though to be honest I think I’d need to drop a couple of teeth off the front cog before I got stuck into sucky mud. I reckon Reid are having a bit of an each way bet with the SSCX. They’ve shot for the mid-ground and I think that tells us where Reid sees this bike. It’s whatever you want it to be. Swap a cog if you want to dedicate it to cyclocross perhaps. Swap the tyres if you want to ride it on roads. Or just enjoy the bike as is, ride the damned thing everywhere like I did, from home to beach and lake and cross-country and then back through the bike trails of suburbia. 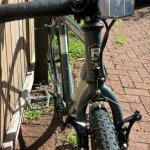 There’s the right fixings to add a rack, further indication that Reid expect the SSCX to be versatile. The first few moments after I got on this bike I felt like the front end wallowed. The feeling dissipated soon enough. But I was left wondering if this wasn’t just a road bike with a raked out front end. The answer isn’t obvious until you get it off road. That’s when the bike makes perfect sense. Handling off-road is natural and intuitive. It’s not mountain bike and it’s not road bike. (One likes to draw parallels, you see…) It feels a lot more like a road bike than last CX bike I threw a leg over. The main thing here is, the bike goes where you point it. Ever ridden a road bike off-road? You have to kind of hang on and steer the bike by force of will. With the SSCX you can point where you want to go and reasonably expect the bike to go there. I even got a little whip happening on some trail obstacles once my confidence was up. Few bikes invite to be skidded the way this one does. The front end just wants you to lean on it and break traction at the rear. And who am I to disappoint? With slightly knobby tyres the traction riding on roads and paths was skid friendly. I’d hate to take back bald tyres so I’m glad I’ve spent more time off-road where getting my skiddy thrills was harmless to the rubber. The back end loved to be trying to say hello to the front and driving it into corners this was was too much fun to resist. Which is good because in some ways I never quite got rid of that sensation of the front end wanting to wallow. Was it just me? We got a fair bit of rain and I never really wanted to lean it over on wet roads. But who needs to when cornering is better done at a slide. The bike felt so comfortable off road I had to remind myself that it wasn’t a mountain bike. The bike and the trail reminded me soon enough. I’m used to having 140mm of boing front and rear to soak up the bouncy bits. With nothing but myself as suspension I was reminded how quickly things can get out of shape when you hit some rocks or roots at speed. The more I rode the SSCX the more fun I had. Flat off-road trails are a bore on a proper mountain bike. On the SSCX they were a treat. I discovered the pleasures of exploring gravel tracks, finding unexpected trails in places I thought I knew pretty well. Big knobbies and loads of front and back bounce are also a complete bore on sealed roads. On the SSCX the ride home was just an extension of the rest of the ride. Tearing down to Burleigh with a screaming tailwind I ran out of pace. Left wanting a bigger gear. Not by much. The flipside was that it allowed me to get home from exploring those trails without feeling like I was dying. My fitness isn’t at the impressive end of our sport and a couple hours in the saddle and some undulating terrain on the way home made me grateful for the gearing the bike carried. I’m a bit of a convert to the idea of a gravel bike now. I’ve hated on gravel bikes before. 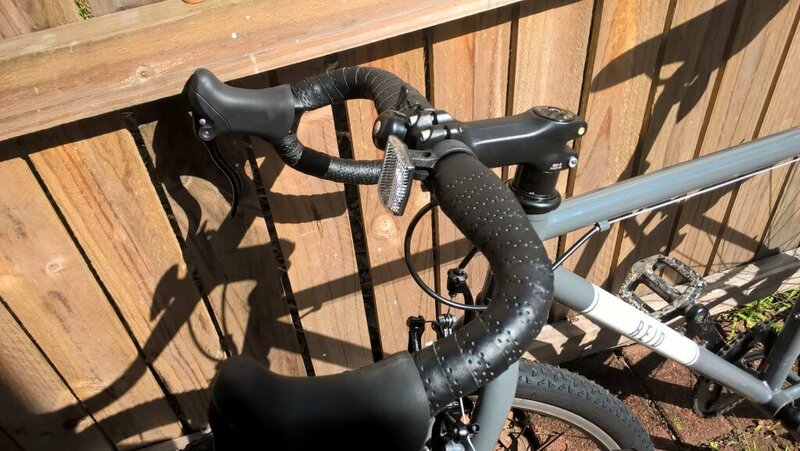 Aren’t gravel bikes just normal bikes ridden on gravel? Do we need another type of bike in our garage? That’s the kind of thing I said. The answer is, I’ve discovered, yes. This bike fills a niche and it’s buckets of fun when used to explore. So I’m reassessing my attitude to gravel bikes (but I still for the moment deplore fat bikes, until perhaps I actually ride one). As a road bike it’s not as fast as a fixie would be. You’re carrying more weight and you’ve got bigger tyres and that slightly lower gear. The flip side is the bike helps you find new ways to navigate the streets. You start finding ways to do things you couldn’t on a more delicate ride. So rather than picking my way through street works, I barrelled through them. I feared gutters less (though to be honest my bunny-hop was woeful) and I could trackstand for days on this thing. 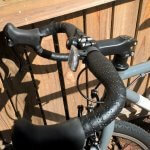 It was so stable I found I could do things I couldn’t do on my own bike, like rolling backward during a trackstand while looking sideways down the road for traffic, pushing forward again as the car passed. The trackstand itself didn’t need my focus to make it happen. (If only I looked remotely as cool in real life as I did in my imagination while doing this.) If you’re struggling with track stands, get this bike (or, you know, practise your track stands). The first thing I noticed were the center-pull brakes. 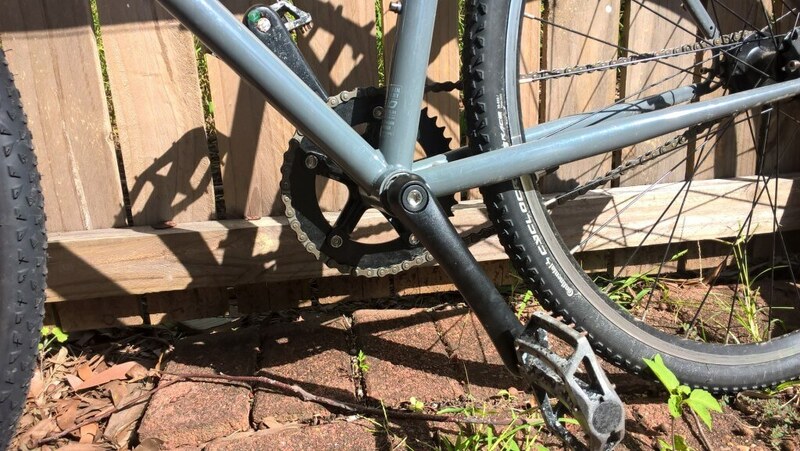 I remember mountain bikes transitioning from center-pull brakes to v-brakes and then to disc. (Giving my age away again.) I’ve often wondered why so many bikes like tourers, cyclocross and gravel bikes still use center-pull when v-brakes were so much better. Well I’ve got my answer. Because center-pull brakes work just fine. And you don’t have to stuff around nearly as much. Getting the best out of v-brakes required a lot of fiddling. These brakes were set-and-forget and always had enough braking for a bike of this type. It’d be great to see disc brakes on this type of bike. But not at this price. If you saw disc brakes on a bike at this price you could assume one of two things. Either every other component was sacrificed so they could get disc brakes on there for marketing purposes. Or the disc brakes themselves were rubbish. 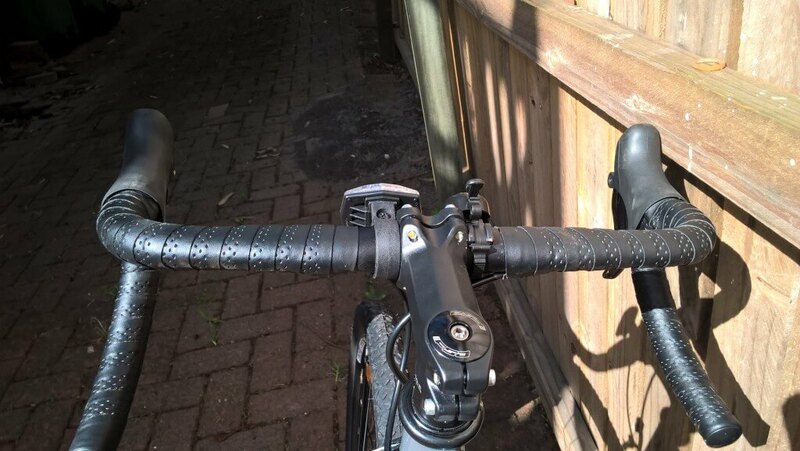 I like that Reid have made a practical and functional choice for us cyclists. The bottom bracket and crankset are a no-name combo looking good in matt black. You’ve got a square taper bottom bracket. That might give some hassles down the track for those with big legs but at this price I’ve not seen any brand offer splined bottom brackets. All bearings are sealed, as I’ve come to expect from Reid, and that includes the wheels. There are a good looking set of Alex double-wall rims running on those hubs. They look the goods and ought to stay true through a fair bit of abuse. 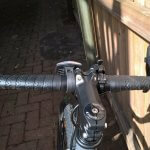 The handlebars are good for their job, with that small drop common to cyclocross bikes. The top bar is flat to give you somewhere to rest your hands on long grinds. Peddles were the standard generic things you’re expected to replace in favour of your own. I threw on some rather beat up old flatties and I was happy with that. 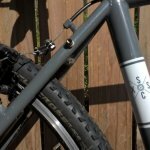 The question you’re probably asking yourself is, should I buy a Reid SSCX? The thing with a bike like this is it’s probably a discretionary purchase, a 2nd or 3rd bike. You could easily use it for your only bike. It’d take some city rubber and change into dirty clothes for the weekend. But many people are probably sizing it up as a bike to add a little fun to their cycling. And it is loads of fun. I went places I hadn’t been and discovered things I didn’t know existed. This was the most fun I’ve had reviewing a bike. I always love reviewing bikes but most of them only take me where I’ve been before, or could go anyway. I’ve got six bikes in the shed and most of them could have done what the review bike did. But not this time. The SSCX filled the niche between road bike and mountain bike. A niche I didn’t really know existed. It’s a bike you can ride around on the road comfortably but as soon as it sniffs some gravel you can let it lead you astray. As a 2nd bike it’s certainly at an obtainable price. Five hundred bucks isn’t much to pony up for a bike. The frame is finished quite nicely and the components shouldn’t need much in the way of maintenance. 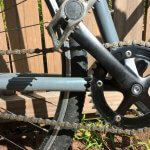 If you’re riding off-road you might change chains more than you would your road bike. 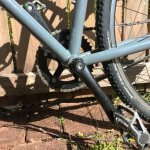 If you’re a big masher you might find issues with the bottom bracket eventually. Apart from that it’ll be a wallet friendly way to extend the potential of your cycling. It’ll ask the question of you, where are you going to take me, and force you to find ways to validate your purchase. And that’s a great thing, whether it be cyclocross racing or exploring back trails, getting the most out of this bike will necessitate having more fun than you would otherwise.